Pollution from farms is huge, a new study says – emissions from agriculture outweigh all other human sources of fine-particulate air pollution in most of Europe, the USA, China and Russia, says a team of scientists. However, they add that it is not all bad news. The culprit: animal waste and nitrogen-rich fertilizers that combine in the atmosphere with industrial emissions to form solid particles – a major source of many human diseases and deaths. Susanne Bauer, an atmospheric scientist at Columbia University’s Center for Climate Systems Research and the NASA Goddard Institute for Space Studies, Ron Miller and Kostas Tsigaridis, both also from Columbia, wrote about their study and findings in the academic journal Geophysical Research Letters (citation below). Pollution refers to substances, chemicals other substances in the environment that should not be there and may be harmful. The authors stress that it is not all bad news. If industrial emissions are reduced in decades to come, as most forecasts say they will, fine-particle pollution will decline even if fertilizer usage doubles. 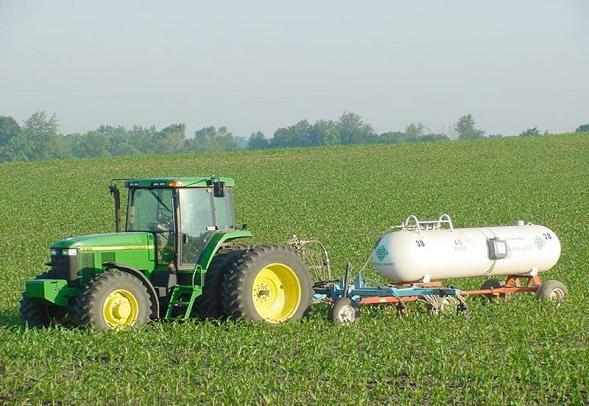 Air pollution from farming comes mainly in the form of ammonia, a compound of nitrogen and hydrogen with the formula NH3, which enters the atmosphere as a gas from livestock waste and heavily-fertilized fields. The NH3 then combines with pollutants from combustion – mainly with nitrogen oxides and sulphates (US: sulfates) from vehicles, industrial processes and power plants – to create minuscule solid particles or aerosols up to 2.5 micrometres across, or less than 1/30 the width of a human hair. A micrometre, also called a micron, is one-millionth of a metre. When we breathe these particles in, they make their way deep into our lungs and cause pulmonary and heart disease. According to a 2015 study published in Nature, they are responsible for at least 3.3 million human deaths each year globally. This is not the first study to point the finger at agriculture as a major source of atmospheric pollution. Several regional studies, especially in the USA, have shown that farming is a prime source of fine-particulate precursors. The authors say that this latest study is the first to look at pollution from agriculture globally, both today and in the future. It shows that over half of all aerosol ingredients in central and eastern USA comes from agriculture. The effect is even more acute in China and Europe. The aerosols form mainly downwind from agricultural areas, in densely populated places where far emissions combine through a series of chemical reactions with those of transport vehicles and other sources. Dr. Bauer says it is ‘good news’ that emissions from farms have to combine with other pollutants to make aerosols. With tighter regulations today, higher-mileage vehicles and cleaner sources of energy, there will be smaller quantities of pollutants for the agricultural emissions to combine with, i.e. 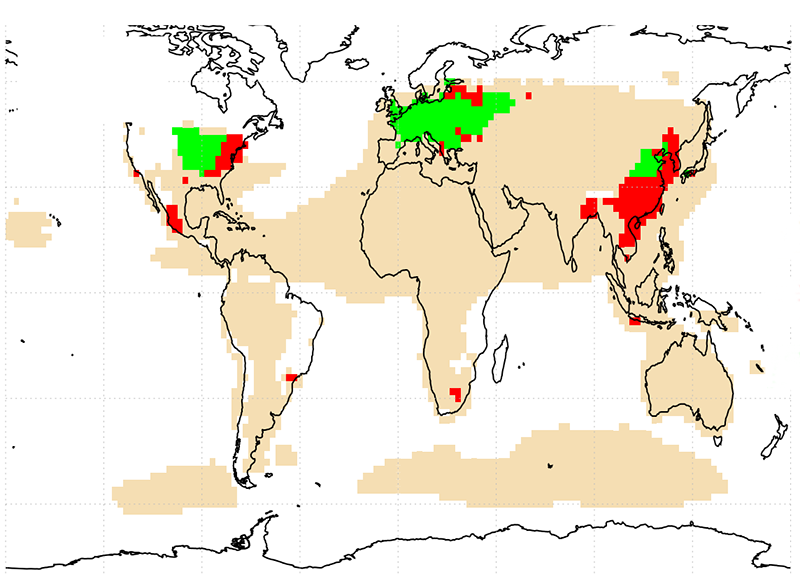 aerosols from agriculture is forecast to decline significantly. A study published at the beginning of this year showed that global industrial nitrogen oxide emissions fell from 2005 to 2014, even while farm emissions soared. (Fast-growing India and China are exceptions). Total artificial fertilizer production in 1950 was 20 million tons, compared to almost 190 million tons today – approximately one third of them are nitrogen-based. Fertilizer production will nearly certainly continue increasing to keep up with the growth in the global human population. However, the amount of aerosols created as a result depends on several factors, including precipitation, air temperature, time of day, wind patterns, as well as the other required ingredients from industrial or natural sources. In parts of the Middle East, Asia and Africa, aerosols or their precursors come mainly from wildfires, sea spray and desert dust. Africa will probably experience the greatest increases in farm emissions, while Europe will see the slowest. ** Abatement refers to the elimination or reduction of something unpleasant, such as harmful substances, taxes, penalties, rents, noise etc. “The article underscores that all source categories should be controlled. One should be cautious about suggesting that food production could be increased without increasing pollution.” That critically depends on the assumption that industrial emissions will definitely be curbed. Prof. Lelieveld, from the Max Planck Institute for Chemistry, Mainz, Germany, referred to the recent scandal over Volkswagen’s fraudulent auto-emissions controls, and pointed out that even with the recent reductions in industrial pollution, most countries including the US still have huge areas that exceed the World Meteorological Organisation’s recommended maximum of 10 micrograms of fine particulates per cubic metre. According to Dr. Bauer, if future industrial emissions are reduced, much of the ammonia from farms will end up roughly 2 to 10 kilometres from the ground, up in the Earth’s troposphere. At that altitude, lightning and other natural processes may also help create fine particles – “but it will be so high up, it won’t be a problem for us,” she said. She added that most of these particles would be trapped by raindrops and removed harmlessly. Even so, pollution from farming raises other concerns. Enormous quantities of excess fertilizers wash off fields each year, and pollute huge watersheds. For example, every summer an oxygen-starved ‘dead zone’ spreads from the mouth of the Mississippi River, fueled by excess nitrogen from upstream. Dr. Bauer said that more careful application of fertilizers could solve a lot of this. On the other hand, industrial sulphates are believed to reflect solar radiation, and thus marginally mitigate ongoing global warming caused by other fossil-fuel emissions. Citation: “Significant atmospheric aerosol pollution caused by world food cultivation,” Ron Miller, Kostas Tsigaridis and Susanne E Bauer. Geophysical Research Letters. 16 May 2016. DOI: 10.1002/2016GL068354. Conservationists and environmentalists are concerned about the damage that nitrate-rich manure has been doing to humans and the farms it is used on.